We all celebrate the time during Easter differently, even around the world. Whether it’s to go on Easter egg hunts and handing out chocolate bunnies or going to church or flying colourful kites like in some countries, we must be vigilant to the potential dangers of traditional Easter treats to our four-legged friends. Here are a few potential dangers to look out for during the Easter season, but also during the rest of the year. We all love chocolate, and so do our furry friends (pets fed small amounts may develop a taste for it and actively seek out chocolate, leading to intoxication). Chocolate comes in many forms, such as bakers chocolate, candy, chocolate baked goods like cake and brownies. The main toxic ingredient is METHYLXANTHINES, which consists out of caffeine and theobromine (primary causative agent). The highest concentration of these toxins are found in cocoa powder, bakers chocolate, semisweet chocolate and dark chocolate. Less is found in white chocolate and milk chocolate. In dogs, even a very small dose of theobromine can result in clinical signs as early as 6- 12hours after ingestion. The earliest sign of toxicity is usually an increase in thirst, which can be followed by vomiting and diarrhoea. Because this is a stimulant, the patient can start to show signs of agitation or restlessness/nervousness (at any dose). But more dangerous, is the effect on the HEART and NERVOUS SYSTEM. These patients can show an increase in heart rate (tachycardia), which can progress to fatal cardiac arrhythmias (abnormal heart rhythms). Eventually some can have seizures, muscle tremors or incoordination. In addition to the toxic effect of chocolate, the high fat and sugar content can also cause problems like nausea, diarrhoea or even pancreatitis. Nothing is more traditional during Easter than the hot cross bun. 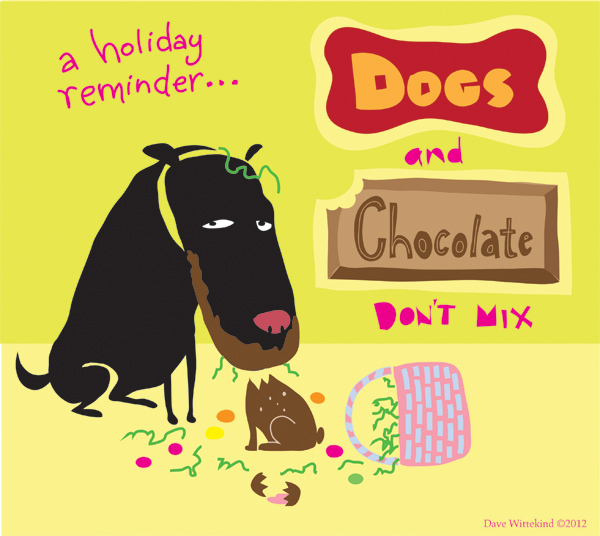 Delicious and lovely baked goodies to share between family and friends….BUT BE CAREFUL FOR OUR PETS. These baked goods contain RAISINS which has been associated with the development of ACUTE KIDNEY FAILURE in especially dogs, but there are anecdotal reports that cats and ferrets can also be affected. Some toxicologists think that cooked raisins (like in raisin bread, hot cross buns) are not toxic, but this has not been confirmed and some dogs have developed kidney damage after eating baked goods. 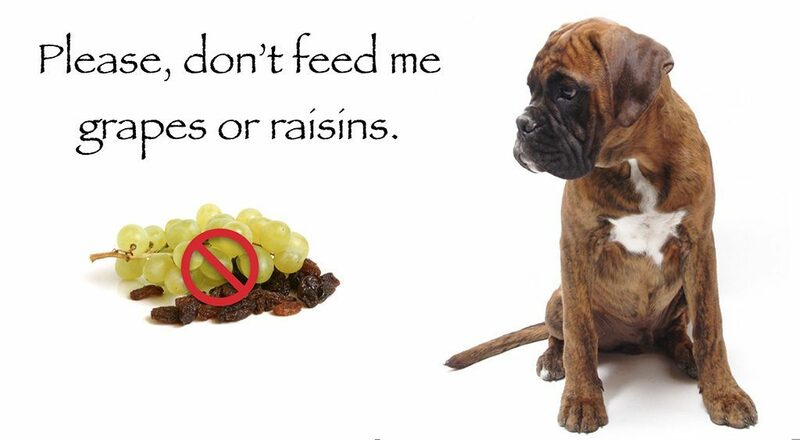 As little as 5 grapes, can lead to toxicity in an 8kg dog – AND RAISINS ARE 4.5 TIMES MORE CONCENTRATED THAN GRAPES. …but this is a risk not worth taking, as the possible consequences can be so serious. These patients develop vomiting and acute injury / damage to the kidneys within 24 hours after ingestion. Some of these patients can be helped if treated very early (<18 hours after ingestion), but prognosis is guarded once the kidneys have sustained injury. With the Banting evolution, the sugar substitute xylitol, has become more utilized in various foods. It is used as a sweetener in puddings, cakes, baked goods and beverages. And during Easter, true Banters will also be looking out for sugar-free alternatives, commonly containing xylitol. This is very dangerous to especially dogs. After a dog consumes xylitol, the body releases a large amount of insulin (the hormone that regulates blood sugar levels), which leads to a rapid and dangerous onset of HYPOGLYCAEMIA (low blood sugar). This drop in blood sugar can happen as soon as 15-30 minutes after ingestion! These patients start to vomit, followed by weakness, incoordination, collapse, seizures and even death. Some patients can even develop liver failure as early as 12-48hours. Also be careful that common household products like toothpaste and oral rinses, medication, sugar-free gums and sweets, some nut butters like peanut butter can also contain xylitol. READ THE LABELS (especially sugar-free products) AND LOOK OUT FOR THIS, SOMETIMES REFERRED TO AS SUGAR ALCOHOL. These nuts are commonly found in baked cookies, or just chocolate covered as a sweet treat. 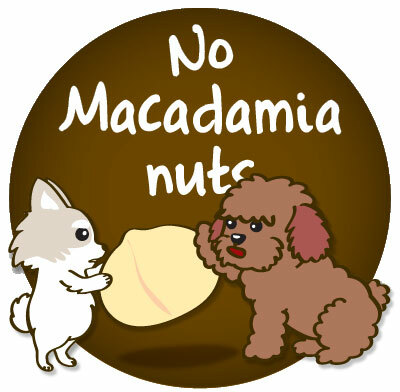 Dogs can develop weakness (commonly of the hind limbs) and muscle tremors if ingesting more than 2g/kg of these nuts. Because these nuts are also high in fat content, pancreatitis (a painful and dangerous inflammation of the pancreas) is also a possible sequel. These are just a few food-related dangers to look out for this season. If you suspect that your pet ingested any of these substances, or you accidentally fed it to your pet, please seek veterinary help as soon as possible. Rather stick to pet-friendly and safer alternative when treating your furry friends.